Once again Aurora’s dancers performed for a good cause at the RAC Gala Night. At this event, graced by the honourable Datuk Ng Yen Yen, Malaysian Minister of Tourism, percussionists from the SKILL Academy together with our hip swaying girls in mardi gras fashion treated the audience with a calypso and samba combo. 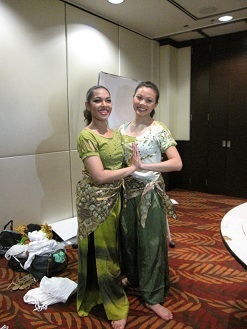 On stage next were Aurora's award winning dancers, Siti Amellia and May Jean performing an old favourite, Hijau.